What's Inside My Carry-On Makeup Bag? I have been the victim and offender when it comes to carry on makeup. The victim because I have been falsely accused of over stuffing the stupid, tiny little plastic bags (I was quick to point out that despite being stuffed to the brim, it did shut with a bit of a tug!) and the offender where I have tried to make my way through security with not one but two carry on makeup bags. I have been travelling quite a lot recently and as much as i try and squeeze in as much as I can, it doesn’t ever really seem to work. I begin to panick and come out in hot sweats when I approach the airport security and know I must pull out my plastic makeup bag that weighs more than a baby and is quite obviously splitting at the seams. Choosing the selected makeup and writing this post did feel like I was back in school picking people to be on my team which was quite amusing (not that I was ever picked first!). My carry on makeup bag is in no particular order but, there is an idea to every essential! First in my makeup bag for the plane is my bronzer. This bronzer is by Ted baker and unfortunately I have never been able to find it again. The reason I chose this bronzer to come with me on my travels is because it’s really buildable. If I am really tan it works and if I am quite pale it works, it’s perfect too. I chose to carry a brown eyeliner instead of a black in my carry-on bag because it isn’t as harsh. If I am walking around all day and sweating it doesn’t seem to react as badly as black does to my eyes. The push up drama mascara was carefully chosen. I had a lot of contenders but, this one made the cut. I love this mascara (you can read my review here) and it just looks lovely even without eyeliner or eye shadow so, for them days where I don’t need a lot of makeup, it is the perfect accompaniment with me to wherever I may go. Of course I would choose my right hand man, my trusty foundation. I love this foundation and struggle to see myself wearing anything but this. It’s the perfect shade for me, even when I do get a tan so, it went straight in to my aeroplane makeup bag. I chose to bring my NYX finishing powder for no reason other than I couldn’t not bring it. It’s new to my makeup collection and it just is so silky and lovely and I couldn’t not, so i hope that is reason enough…. I needed a highlighter and although it sadly smashed only a few days ago, I did choose my kiko highlighter. It works well with me and is really easy to carry in my carry on makeup bag. Also, what is holiday makeup without a highlighter? I carefully picked three brushes. This was tough but, I did it. I packed inside my makeup bag a contour brush, but i use this for my highlight, bronzer and setting powder. I have an eyebrow brush to use with my eyebrow powder and a real techniques precision brush to use with my concealer. Tactical packing I think they call it. Next is my brow stuff. I didn’t realize how grubby my powder looked until now and I deeply aplogize for living in such a state but, it works and is my holy grail eyebrow routine. 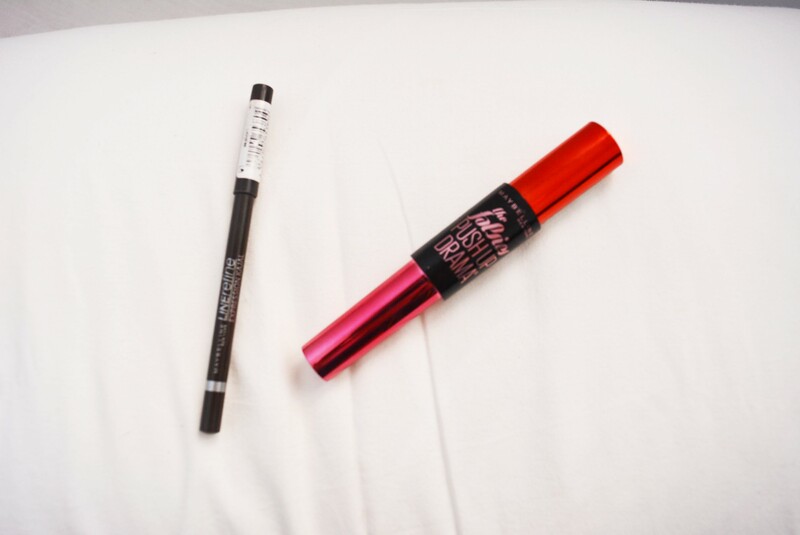 I use the brow drama crayon (here’s my review!) to fill in sparse areas and my wet and wild powder with a eyebrow brush to fill them all in. I was so torn with bringing my brow drama mascara but, it didn’t make the cut for my ‘natural’ carry-on makeup bag. I wasn’t initially going to bring a primer but, I did anyway. Just because I remembered I am meant to look good in photos and I never will with my makeup rubbed off. I love this primer, I always talk about it so therefore it made the cut. My concealer is one I use all the time, it’s just the maybelline cover stick. It’s so nice and works really great with me and my skin so no way was it being left out of this travel makeup bag. I of course always use the nivea soft moisturizer but, it does take up quite a lot of room in my carry on makeup bag and whilst being torn between having to once again fight through security to just bring my moisturizer I came across this little gem. I bought in Lush ages ago and it’s the perfect size for short weekend breaks. Next to that is my kiko eyeshadow. I think it’s in the shade ‘infinity’ it’s a gold/brown colour and looks so nice with natural or more made up makeup so, although it was a tough choice, it takes up hardly any room and just had to come. I did it!! I have all of my holiday/travelling makeup essentials and still a teeny bit of room left incase I have left anything else out! The only thing I wish I could fit in is my sunscreen but, I am yet to find one small enough to get through security! I hope you enjoyed my ultimate carry on makeup bag guide, if you did please let me know in the comments below and let me know your essentials!